Averi Jordan, Alan Mill, Andrea Bentley, Danielle Bentley, Shawn Rowland, Pamela Fairchild, Jackie Carr, Kathleen Cook, Mark Lamere, Sean Jones. A Denver man who led a criminal racketeering scheme to sell stolen identities in exchange for methamphetamine and heroin has been sentenced to 14 years in prison. Sean Jones, 36, will serve his 14 years after he finishes a 10-year prison sentence that he was given last year in Arapahoe County for running a similar scheme. Jones and 10 others were charged in May 2016 on a 186-count indictment accusing them of stealing mail to obtain identifying information and checks. The crooks would use the information to make fake checks, forge the signatures and cash them at banks. 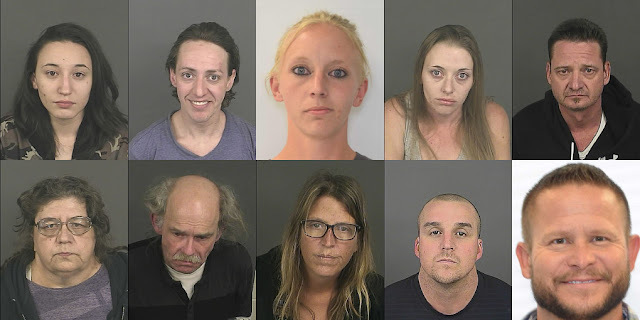 The ring members would buy, sell, trade and barter the stolen financial information and forged checks to buy drugs, mostly methamphetamine and heroin. Collectively, they amassed at least $100,000, stolen from more than 400 people and businesses. Eight have already pleaded guilty and are serving their sentences.